So this time last year, it was seven days before my Mom died. I thought that I’d be able to watch a precious image of a Mom and daughter, in a mall, on a show, at my relative’s house, walking by my office — without missing her so intensely that I can’t breathe. I thought that I would be able to logically and reasonably wander through these days… this “anniversary” that doesn’t need to be celebrated… without feeling much. I actually mistakingly thought this about every.single.holiday and notable occasion this past year, too. “It’s ok. You can do this. Sure it’s your first [fill in the blank] without your Mom, but you’ll be ok!” But Mother’s Day isn’t the same when you don’t have a Mom… It doesn’t hit you until it hits you… And then, it hits you hard. In the days following her death, I couldn’t register it. You could have been speaking Swahili to me — because nothing registered. All I felt was was numbness. The pain hadn’t started yet. And, here we are. Seven days shy of a year. I don’t think there’s a trophy for this. I feel as if I’ve been holding my breath for the past 358 days. I have so much to tell her. So much has happened. Our lives have changed. When I see her, I will be able to exhale and feel better. Because let’s be honest: NO ONE CARES ABOUT YOU LIKE YOUR MOM. I want to apologize for ever being short with her or for being a jerk. I’ve been dragged down the road that so many others have been dragged down before me; the long, sharp-rock laden, rocky road of horrendous grief filled with tears and ugliness. On this road you can’t walk, because your legs are numb… and they can’t carry the weight of your sadness and pain. How are we doing? My little sister and I? My Mom’s two children; her two daughters? Life isn’t the same. When we’re together, there’s someone missing. We both cry and apologize to the other one, “I’m sorry. I just can’t keep it together.” And the other says, “It’s ok. I understand. Do what you need to do.” We remind one another of her and that’s hard. I think we’ve learned to be strong for one another this past year. And, we’re closer than ever. Instead of calling my Mom everyday, I call Taryn. And, our roles have reserved. As the “big sister” I’ve cried to my “little sister” and she has stepped up and been positive, or affirming… or she just listens. She always knows what to do. And I try to be there for her. I try to be like Shirl. Taryn and I laugh, too. And I don’t know how my sister feels, but when I’m with her, I feel like I’m home. I feel as close to “home” as I can feel. And sometimes that all I want to feel. In the days and weeks following the accident she and I would retrace it all. EVERY CONVERSATION was comprised of our theories of “how” and what happened. What she was thinking? Did she know? We had the entire timeline of her morning on September 9th, 2013, completely and wholly retraced. We needed to do this. …and so does the heart. Then, as time went on, the conversation slowly morphed into… talking. The “how she died” faded away and I can safely say one year later that it doesn’t matter to me how my Mom died. It’s not important. She’s more than that. But, I can also tell you that I keep the photos of her smashed and crumpled car on my phone… the photos of the steering wheel that I held for what seemed like hours because I just wanted to touch what she touched when her spirit left her body. It was a sacred place. And I look at these photos still. Not as often as I used to, but I look at them. I even hold the broken pieces of her windshield in the palm of my hand every now and then. I remember the drive home from my office knowing that I was now living in a world where my Mom wasn’t. I remember the phone calls I made sitting in the passenger seat of my car, next to Craig in the driver’s seat, before I walked into my house with a smile on my face to see my babies who had no idea that my heart had just been irrevocably damaged. I remember my Aunt’s response when I told her that her sister was dead. When I told my cousin that his godmother was dead. I remember talking to the sheriff. Trying to remain in control of myself so that I could understand WHAT happened. Today, I just miss her, selfishly. I wish she was here for my baby sister. My sweet sister who shouldn’t have to be living a life without a Mom — at least not this young. I wish she was here for my sweet niece Aubrey, who loved to swing at her house and play in her yard. I wish Eli could make Nana laugh and smile, so she could dote on the only boy in our little family. I wish my girls could make her smile with their little Spanish accents. I wish my Mom could laugh at Vivienne’s antics. I wish I could tell her about the girls’ new school, about the new house, about how much grey hair I have. I wish I could take care of her again. I’m ok with the tears. It’s true, she is worth the tears. This is from August 7, 2013. So cool. My Mom was cool. I wish I had words. . . But Kylee, I know. Oh, do I know.NO ONE CARES ABOUT YOU LIKE YOUR MOM. Yes, I know.Sending you love and hugs and more love and more hugs. You know, it's funny – I wrote this last night – and you know how that goes. Every emotion is more sharp and more intense in the darkness of the night. I'm so thankful for the morning, you know? For the sunrise, my sweet babies, my cute husband, the sound of my sister's laugh on our morning phone call. Throughout this year I'm thankful for the dark nights **and** the mornings of reprieve.I know you know what I mean. Love you. I feel that "yo" added the touch that was needed in this post. (There should always be at least one "yo". )Seriously, though – I can feel your love and support. You're one of my faves and all that stuff. HUGS to you. Oh my goodness. Oh my goodness. Tammy, I wish I could give you a hug. And I'm so sorry for your loss. I'm just so sorry. Thank you for your honesty and for sharing your heart. I'll be thinking of you in the days ahead, and holding you close in thought and prayer. Your mama will ALWAYS be worth the tears. 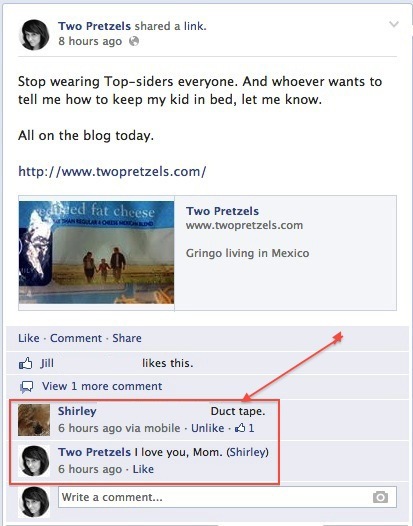 I have absolutely no doubt that Shirley was one of the good ones. Thank you, Abbe. (I always love your comments. )Thank you. Oh Sal, thank you. xo. I have been thinking about you a lot lately. You make me think of this quote:"It is worth remembering that the time of greatest gain in terms of wisdom and inner strength is often that of greatest difficulty." There are no words for what you have gone through this last year and the loss. Oh the loss. But YOU. Your strength, is inspiring. Your words are real and comforting, especially to those who have experienced loss. Your tears are full of love for your mom.No one ever wants to experience loss, but you ARE your mothers daughter and we can see that in your strength.Sending BIG hugs and tears and lots and lots of love to you, my friend. Oh Jenn, thank you.Right after she died, I was talking with a friend and she somehow eloquently told me that extreme pain and despair allows us to feel extreme happiness. That resonated with me. There are so many amazing parts of life, and we relish in those: the first feelings of love, seeing our babies for the first time. But to balance that out, there are moments of utter helplessness and pain. Because of those lows, we maybe respect and appreciate the great moments in life more?Like I said, she was far more eloquent… but it still resonated. Like your quote, perhaps the greatest gain in terms of wisdom and inner strength (and growth) IS because of our greatest difficulties. (I'm not sure if that made sense to you, but it did to me. )Love and hugs to you. Hug.I'll be thinking about you on Monday. Six months… sigh.Hugs back.